A long awaited continuation of the most legendary series of watches in independent watchmaking, the Harry Winston Opus 14 has just made its debut. Here’s what we think of it. The latest instalment in the landmark series of complicated wristwatches, the Harry Winston Opus 14 has a lot to live up to. Conceived by the watchmakers Johnny Girardin and Franck Orny, and then brought to fruition by the engineering prowess of the Harry Winston’s parent the Swatch Group, the Opus 14 is a miniature automaton inspired by a jukebox, powered by a movement made up of over 1000 components. And in a departure from the grand tradition of the Opus series, it was complete and ready for sale the day of its launch. 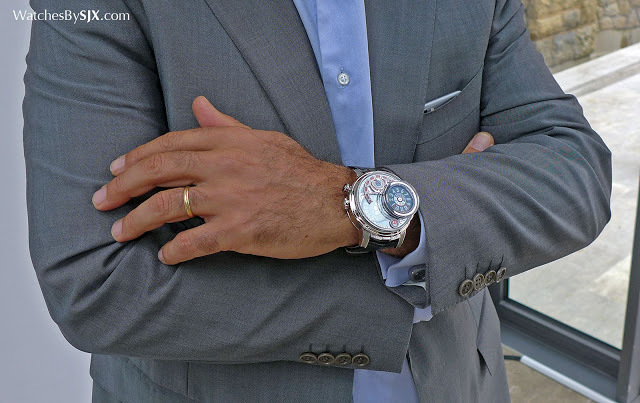 Origins of the Opus The Opus series was conceived by Maximilian Büsser, who later went on to found MB&F, in the early 2000s, as a way to give independent watchmakers more exposure while boosting the watchmaking credentials of the New York jeweller. 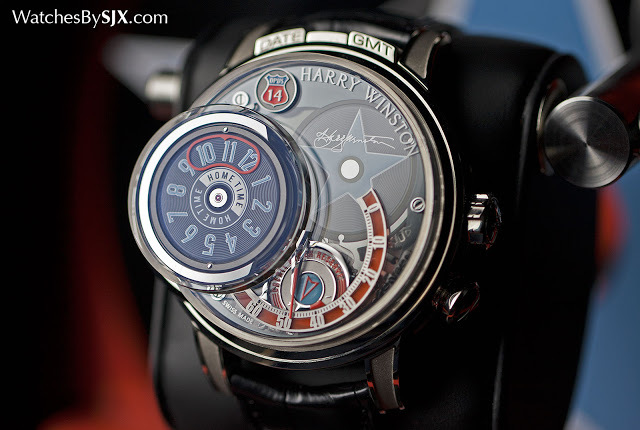 Then the recently minted chief executive of Harry Winston Rare Timepieces, Büsser chose to work with François-Paul Journe for the first Opus, resulting in unique 18 wristwatches. 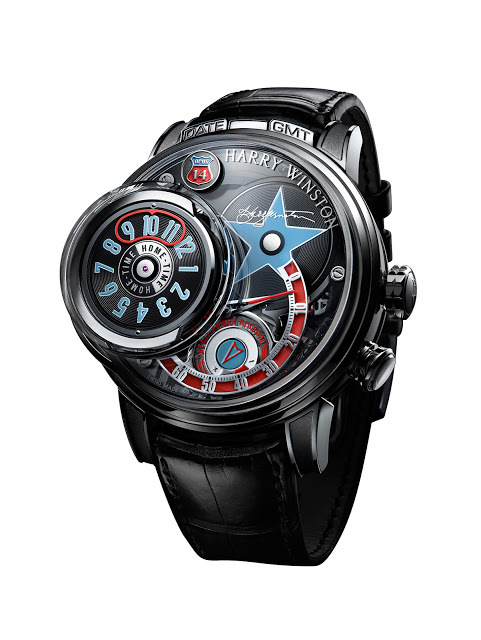 That set the tone for the rest of the Opus series, which became an annual collaboration between a noted independent watchmaker and Harry Winston. That premise was reflected in its name, inspired by Opus One, the California winery founded by the Chateau Mouton Rothschild and Robert Mondavi. 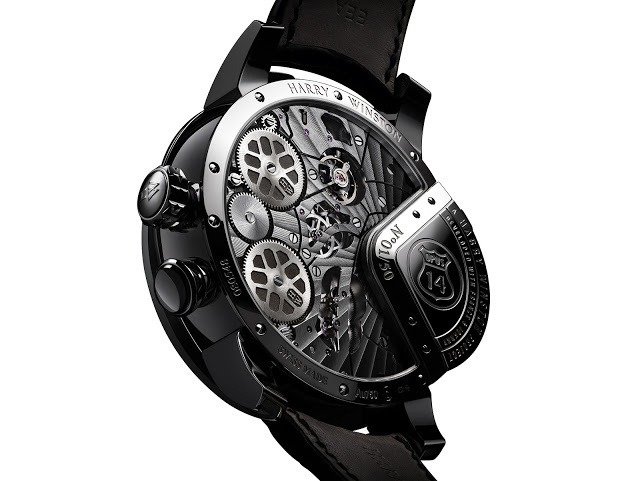 Some of the best and brightest minds in contemporary watchmaking have been responsible for Opus timepieces. 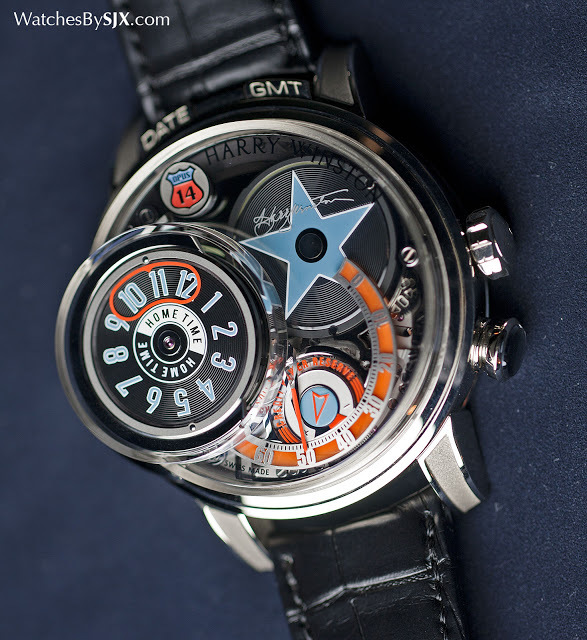 Some like Journe, but also Felix Baumgartner of Urwerk, the duo behind Greubel Forsey, and Vianney Halter, are well known. Others, like Jean-Marc Wiederrecht of complications specialist Agenhor, are less famous outside the industry but no less talented. 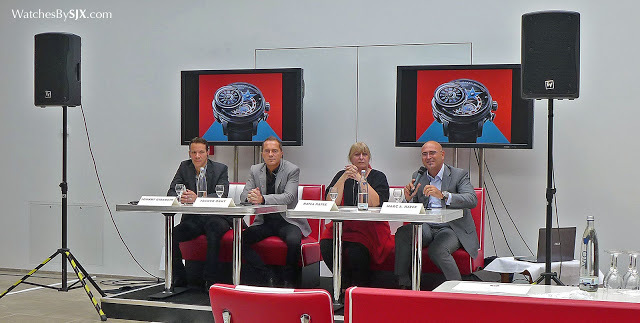 An inherited and intriguing idea When the Swatch Group acquired Harry Winston in 2013, many observers cast doubt on the future of the Opus series, especially given the dispute between Opus 13 creator Ludovic Ballouard and the Swatch Group over payment and ownership. 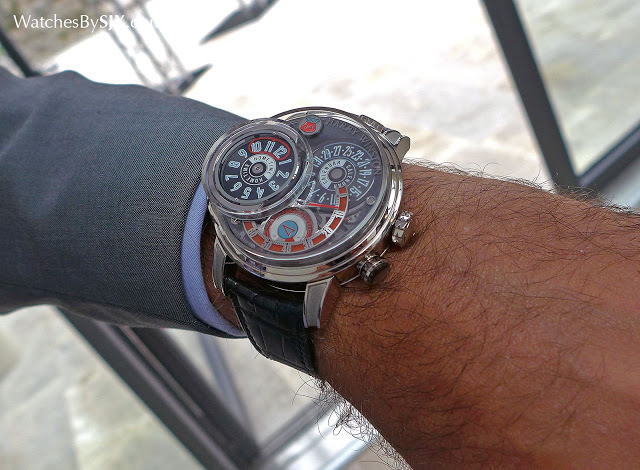 But the concept of the Opus 14 already existed before the takeover, and Harry Winston’s new owners inherited it. Devised by Johnny Girardin and Franck Orny (founders of the boutique firm Telos Watch), the idea was modelled on a jukebox with its stack of vinyl records and an arm to carry the record to the turntable. “[We] like concepts related to daily life,” explained Orny, adding that their desire was to create a complication the wearer can interact with. Girardin and Orny are not new to such complications, having been responsible for the Montblanc Timewriter Metamorphosis wristwatch. That featured a transforming dial that would part in the middle to reveal another dial beneath. Fascinating as it was, the Metamorphosis took several years to come to market due to the complexity of the mechanisms. 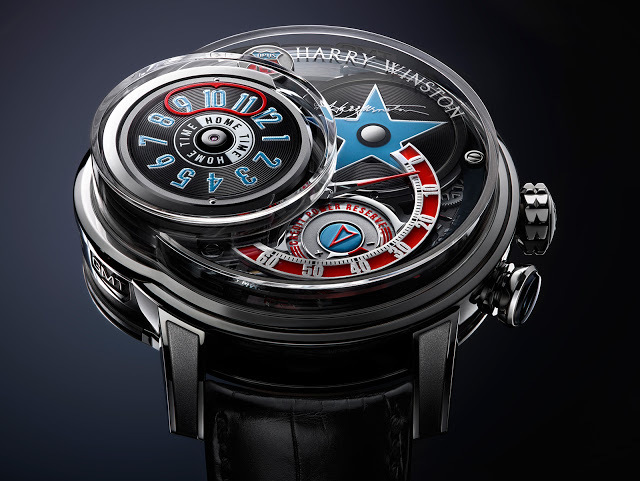 Harry Winston, on the other hand, has the good fortune to be part of the Swatch Group, which along with Rolex is the only wholly vertically integrated watchmaking entity in Switzerland. The Swatch Group’s mastery of engineering and watchmaking is practically peerless. With a little help from my friends Harry Winston had a leg up with the development of the Opus largely thanks to Blancpain and Breguet, the two haute horlogerie watchmakers owned by the Swatch Group. Notably, each brand has its own movement factory, Blancpain with Frederic Piguet and Breguet with Nouvelle Lemania, though both factories have now been merged into the watch brands. Both Blancpain and Breguet aided with the development of the Opus 14, and more importantly, with its testing. While developing the movement took 18 months, testing it took just as long, a process that included automated activation of the jukebox system 4500 times. That’s equivalent of 30 months of daily wear of the Opus 14 and using the jukebox mechanism five times each day. 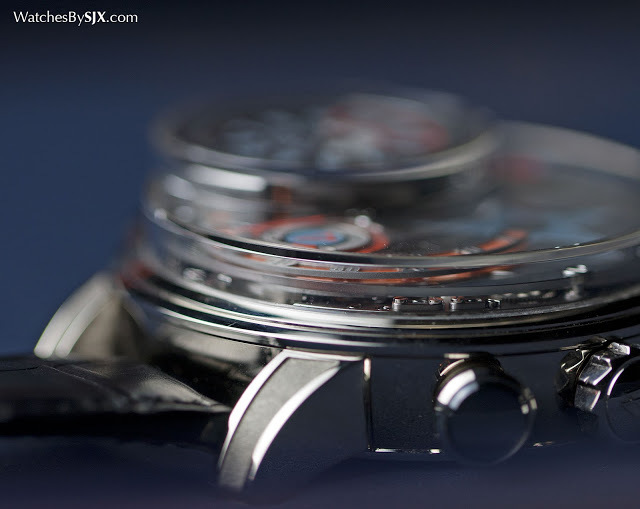 Consequently, the Opus 14 is only the second watch in the series (after the Opus 5 of 2005), to be working and ready for sale on the date of its launch. To paraphrase Oscar Wilde, most Opus watches were a triumph of hope over experience. The Opus 3 took more than a decade to reach the consumer, and there are past Opus watches that remain a fantasy years after their introduction, the Opus 8 and 11 being two famous examples. These never made it into commercial production because the movements are either too complex or too unreliable to produce in series. What it does In the tradition of the series (hence all the undelivered, prior watches), the Opus 14 performs simple functions in an incredibly complex manner – the movement is comprised of 1066 parts. By comparison, the most complicated Patek Philippe wristwatch ever made, the Grand Master Chime, has a 1366-part movement, while Lange’s title holder has 876 components in its movement. Mechanically the Opus 14 is up to scratch when compared against its predecessors. 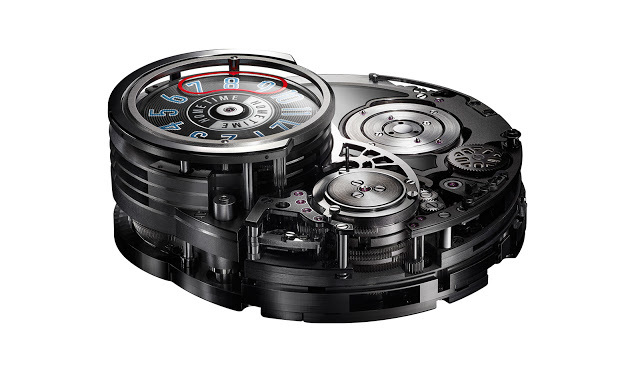 The simplest function on the Opus 14 is the local time (despite the “Home Time” label on it in the pictures), shown on a disc inside the raised sapphire cylinder at nine o’clock. Indicating the time where the wearer is, it is read in conjunction with the retrograde minutes on the red and silver scale that runs from three to six o’clock. Beyond that, it gets complicated. Beneath the local time disc are three additional discs, modelled on vinyl records of course. They are stacked up underneath the home time disc, as LPs would be in a jukebox. A slide on the side of the case at nine o’clock selects the function required. Once selected, pressing the button in the case at four o’clock causes a tiny arm to grab the appropriate disc, pull it out and place it on the turntable-like platform at two o’clock. The movement of the arm generates a noticeable buzz because its motion is regulated by an anchor governor (similar to that found in old minute repeating pocket watches). This was done on purpose, because its designers wanted the mechanism to sound like a jukebox. Three discs can be put on the turntable. The first is a stationary display depicting a blue star as well as the signature of Harry Winston himself; this has no function and is merely for decoration. The second disc shows another time zone on a 12-hour scale, similar to the local time disc at nine o’clock. And the third disc is for the date display. Because the discs are static and unconnected with the movement while in storage, the turntable then spins the disc to show the correct information. So the movement has to know what time or date it is, and then rotate the disc to the appropriate position. While the disc is out, it turns continuously, keeping the time. Pressing the button puts the disc back in the stack, via the same arm. All of this takes 8 to 8.5 seconds, five to bring the disc out and turn it to the correct position, and another three to return it. Two pushers in the case at 12 o’clock, both helpfully labelled, are to set the date and second time zone display. All of that motion requires tremendous power, which is why the movement has two mainsprings, one to keep the time and the other to power the jukebox mechanism; this double barrel set-up was based on similarly constructed Blancpain movements. Turning the crown winds both barrels simultaneously; on a full wind the movement will run for 68 hours, with up to five back and forth disc changes. Actual Americana? The Opus 14 is meant to be inspired by America, specifically 1950s America – jukeboxes, Cadillacs with tailfins and Happy Days. That explains the red, blue and white colour scheme, a logo shaped like U.S. Route shield, the star inspired by the Hollywood Walk of Fame. But the result looks more like a Swiss person’s (or specifically a Vallee de Joux resident’s) vision of American pop culture, rather than convincing Americana. At 54.7mm in diameter and just under 22mm high, the Opus 14 is a monumental watch. Some of the other watches in the Opus series have been as bulky, and its short lugs help the fit on the wrist. But it is still exceptionally large, though not exceptionally heavy it has to be said, which makes it easier to wear. The future Because the jukebox-like mechanism is versatile – the discs can be made to display anything – and limited only by the size of the movement, it might make its way into other timepieces. 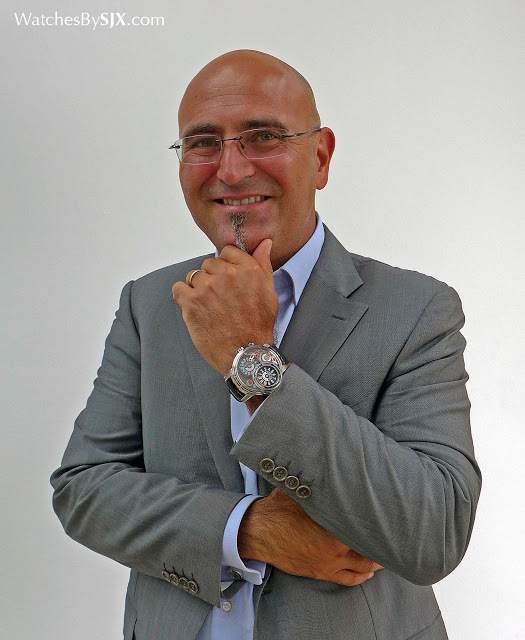 While affirming the special place of the Opus in the company’s offerings, Marc Hayek did concede during the launch “ideas or principles [found in the Opus 14 movement] might be reused in other brands, but not replicated”. More intriguingly, Hayek also added, “This [jukebox mechanism] could do music.” The Opus series will continue, added Hayek, though not as an annual series. Each new Opus will be unveiled when it is ready for sale, most likely every 12 to 24 months, said Hayek. Pricing and availability The Opus 14 is limited to 50 pieces in white gold. 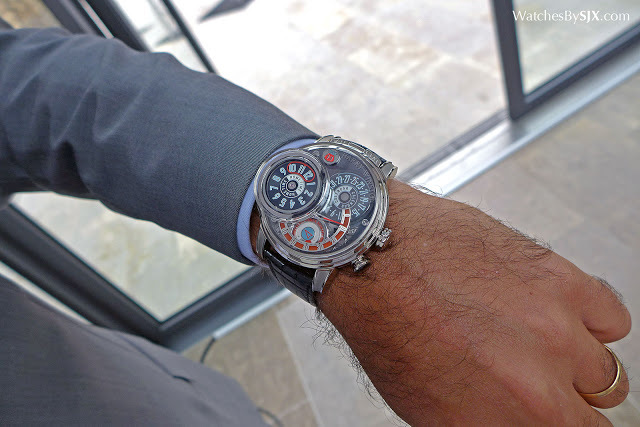 It’s priced at SFr428,000 or €410,000, with a small number of watches available this year. The rest will be delivered progressively till 2017.